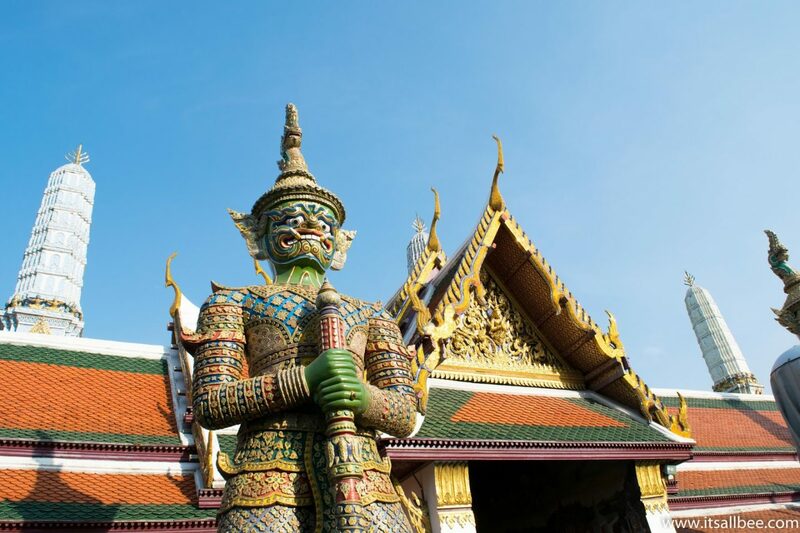 Thailand stirs in us the images of the gold-domed temples, the fast-paced city life as well as the very laid-back beachside life on the other hand. Below is inspiration for planning a trip to Thailand covering a perfect 3 weeks Thailand itinerary. 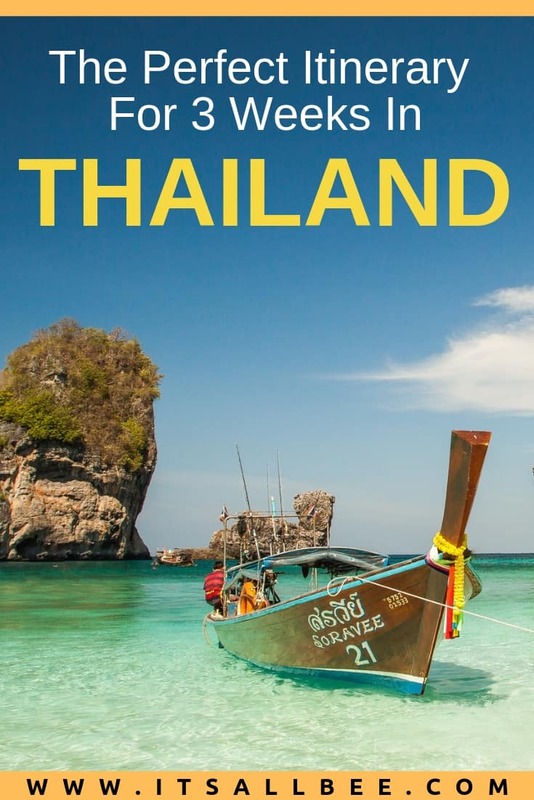 Also included are tops on the 3 weeks in Thailand costs for the trip, where to stay in Thailand, what activities to do in Bangkok, Phuket, Krabi and Koh Samui. You can also use this to supplement a Thailand itinerary 4 weeks or as part of a South East Asia itinerary like we did, visiting Cambodia, Malaysia and China. Bustling with tourists throughout the year, the country is famous for its abundance of green islands in azure blue waters. Thailand is home to some of the most famous tourist spots in South Asia, and this is a fact. Let us start the itinerary with the very happening Bangkok scene in the first week of your 3 week Thailand trip. Also make sure you read up on things to know about Thailand before visiting. The first day of exploring Bangkok, you can start with a visit to the Grand Palace. The buildings and structures for diverse purposes and of differing styles, reflecting the changing architecture during the various reigns of the kings. Despite this, most of the buildings within adhere strictly to classical Thai architecture. 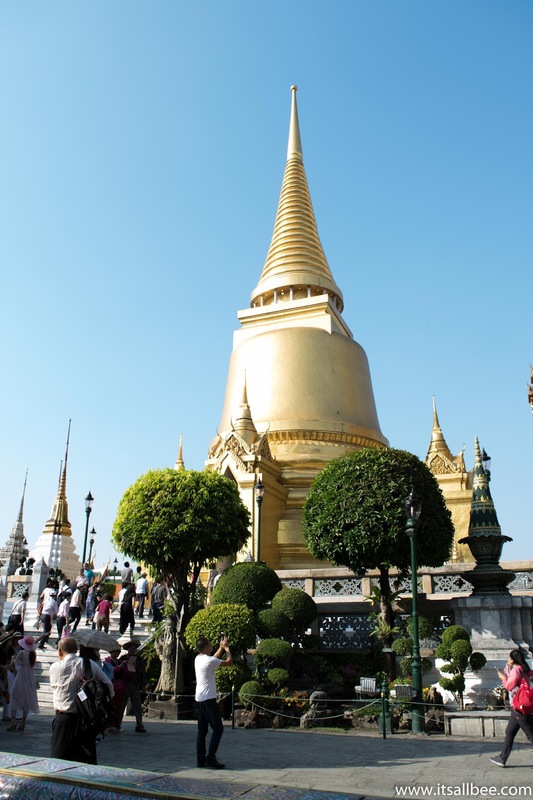 The Grand Palace is a must-visit spot. It is located on the Na Phra Lan Road and is quite accessible. Visitors will be able to view the war memorabilia of Thailand and the ornamental decor and items in use by the royalty. In the same complex, you will be able to come across the gorgeous Wat Phra Kaew Temple or the Emerald Buddha temple. After this trip, you can go to Dusit Palace. The opulence of this white monument is just un-mistaken. The Dusit Palace was commissioned to be constructed by King Rama V after he returned from Europe. Hence, the architectural style of this white marble palace spells European artistry everywhere. The palace is open to the visitors from 9.30 am, and in order to get the tickets, you can consult the Grand Palace ticket office. After these two grand palace visits, you can hop into one of the popular hangouts in the city center. For sunset, be ready to visit the Chao Phraya River coast and take in the breath-taking charm of the Wat Arun temple. The temple with all the lights up twinkles in the dusk skyline and reflects magically on the waters of Chao Phraya river. A river cruise ride with dining is one of the must-dos on your visit in the city. The next day, you can begin on a more spiritual note with the visit to the Wat Arun temple early in the morning during sunrise. Thousands of tourists and devout folk’s throng the Temple of Dawn and watch the marvelous temple at its morning glory. The gilded spires and the 70-Meter high spire studded with stained glass decor add to the charm and beauty at any time of the day. It is necessary to dress modestly while visiting the temples. Just on taking a boat from the Thien pier, you can reach another monument that will spell-bind you this trip to Bangkok. The Wat Pho temple is a majestic temple, which is famous for its 46-meter long Reclining Buddha. 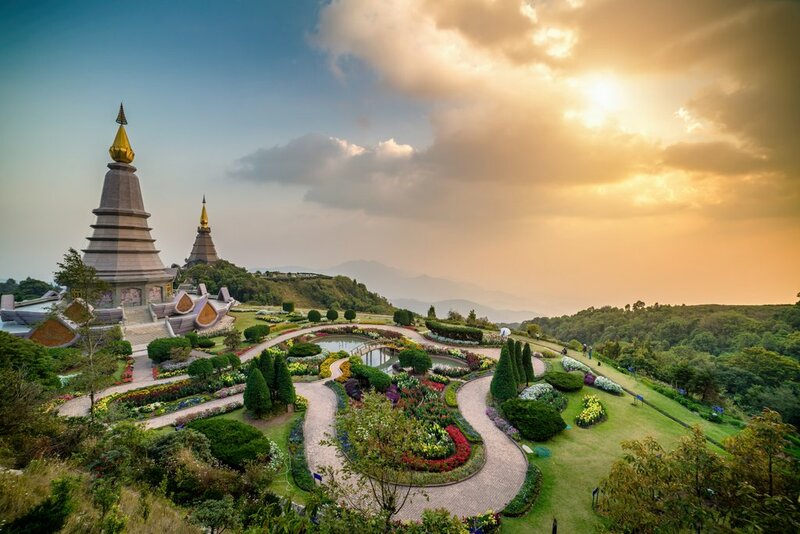 The temple is located on the Sanamchai Road, and it is sure to offer you serenity like no other. Next, on the trip, you can visit the Safari World or Ocean World depending upon your preference. These two places are worth your time and every minute you spend there, will be a great stress-buster. Bangkok comes alive at the night, and this is not something that you were not aware. Thai massage parlors on one side, the risqué nightclubs all give a new lease of life to those who come to Bangkok for the same. The Sukhumvit Road, the bars at Siam, Silom, and Thonburi are all going to bring out the party animal in you. There are rooftop bars hosting classic and absolutely stunning parties that you can never get tired of. The last day can start with a trip to the Dreamland amusement park, or heading of the Old Town for some exploration on foot. The Old Town has European architecture all around and has stores and markets aplenty to shop from. 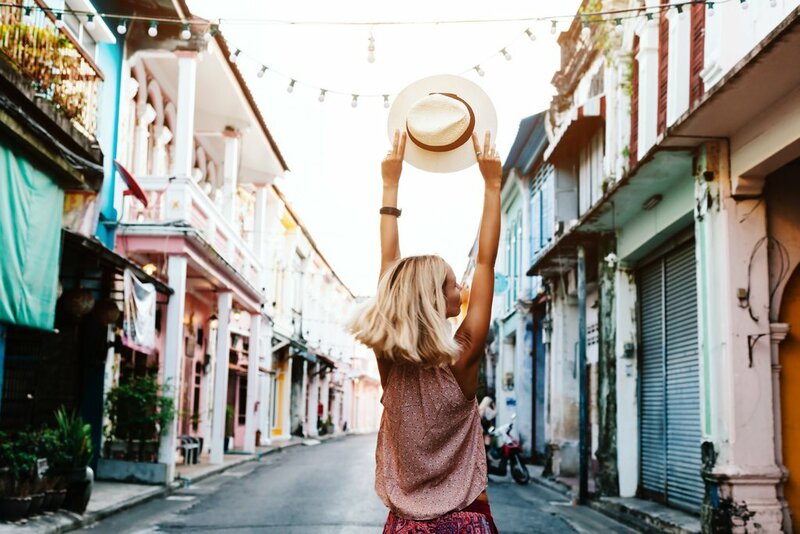 If you feel that you have not had your fill of shopping, heading off to the Floating Market, or the bustling Chinatown is a great option. For tips on where to stay in Bangkok, I have a post on the best areas to stay in Bangkok with hotel recommendations. In addition, I also have tips on the best Airbnbs in Bangkok. If you are new to Airbnb you can also check out my tips on using Airbnb as well as how to get the Airbnb discount. For the next three days, you can spend in Chiang Mai. Chiang Mai is a mountainous city located on the north of Thailand, and it will be a great diversity to discover here in terms of terrain. The city has a great historical and cultural heritage with art and architectural evidence in the form of temples and ruins from the 14th century still existing there. The first-day trip to Chiang Mai can be a visit in the Doi Suthep area. This is a mountainous area covering dense forests and waterfalls, growing across the ranges of high mountains. Trekking through these forests with a guide and reaching the top for a stunning view is a great way to relax. Other than that, a visit to the temple of Doi Suthep to visit the jaw-dropping beautiful architecture of the temple is something that you can think about later. This trip will take a long time and so if after that, you still have the energy for more exploration or spending time close to nature, a visit to the Elephant Jungle Sanctuary can be on the list. The ticketing office is located on the Tha Phae Road, and the trip will involve a safari through the jungle where you can spot rescued or orphan elephants in the wild. There are various other such elephant camps as Patara, Mae Phing, and more to check out. Next day, you can visit the Old City of Chiang Mai. By now, you know the prevalence of Wats in and around Bangkok and in Chaing Mai, you will not find any difference. The number of Wats you will come across in the Old City is also high. There are intricately designed temples or Wats like the Wat Phra Singh, which is by far, the most celebrated one. It then comes the Wat Chedi Luang that is one of the oldest Buddhist temples once even housing the famous Emerald Buddha. Besides that, there is the Wat Sri Suphan with its shimmery coat of silver paint that gleams in the morning sun and in evening lights. The night bazaar or market at Chiang Mai- Kat Rin Kham market, the Kalare Night Market, and others are great destinations for shopping for the local items. From mouth-watering local delicacies to more, these places will be worth the time. The next-day trip across Chiang Mai can be through the local markets and other sights. A Saturday and Sunday Walking Market is a must visit, and if you love adventure trails, then visiting the local parks and going for nature trail experiences can be a great way to enjoy Chaing Mai like no other. If you feel that you are charged up at Bangkok with the exploration and partying, then straight away leave for Phuket. It has many naturally beautiful spots and beaches that will take your mind of things. People visit Phuket primarily to relax and explore the many beaches and limestone rock formations on the beach and as Isles. There are plenty of experiences not to miss in Phuket. 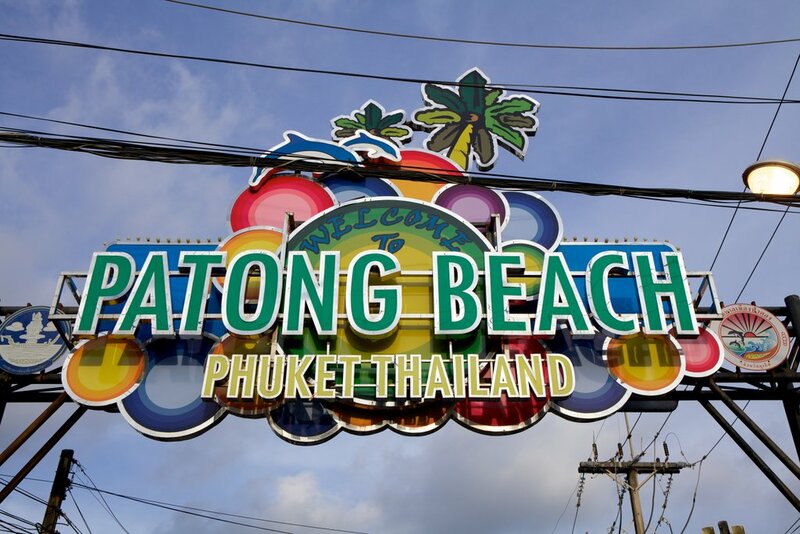 Try to grab a bowl of soup and noodles, or Khao Pad and Kai Yang Grilled Chicken two of the specialties here at Phuket before you begin your day and chill by many of the beaches surrounding Phuket Island. Start with a day tour to Phang Nga Bay. There are day trips to the deep caves here at the bay that is sure to give you goose bumps with their thrill factor. The tour will include exploring the limestone caves that have stalactites and rock formation. James Bond Island is one such marvelous rock formation that gives a stunning view. 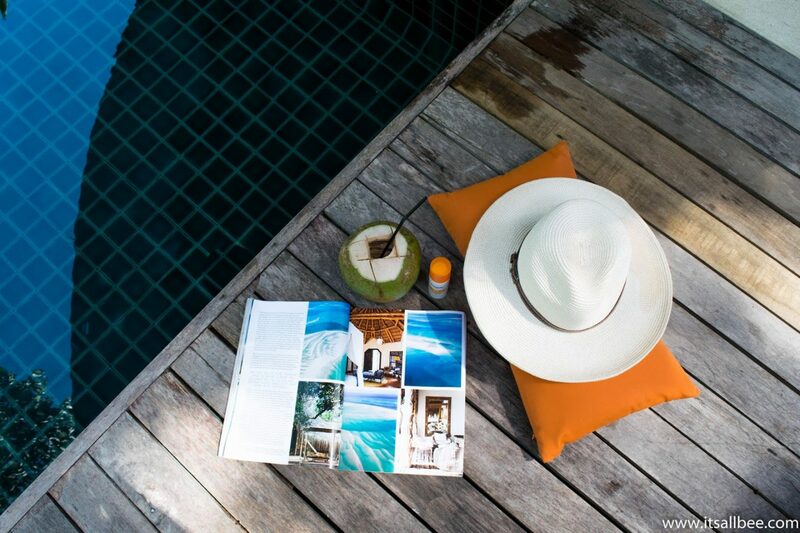 Chill on the beach or explore the markets of Phuket’s Old Town. In the evening you can go to spend the night and party like crazy on the Bangla Road, while watching one of the shows playing currently or else dance and relish the happiness there. 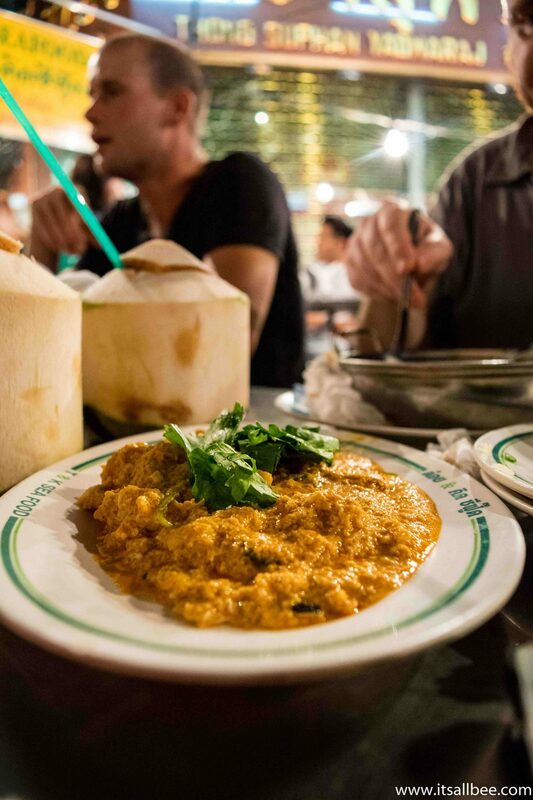 The famous street of Soi Bangla remains closed for traffic from the evening onwards but that just won’t be a problem for those going here for the best Thai experience. Enjoy the beacheas dotted around the island, have a massage or chill by the hotel pool. You can go diving and snorkeling from the Anemone Reef or the Shark Point and explore the underwater life of Phi-Phi islands. Traveling to other islands like Viking Caves, Bamboo Island and even trying out everything from rock climbing to exploring caves, Phi Phi will not disappoint you. 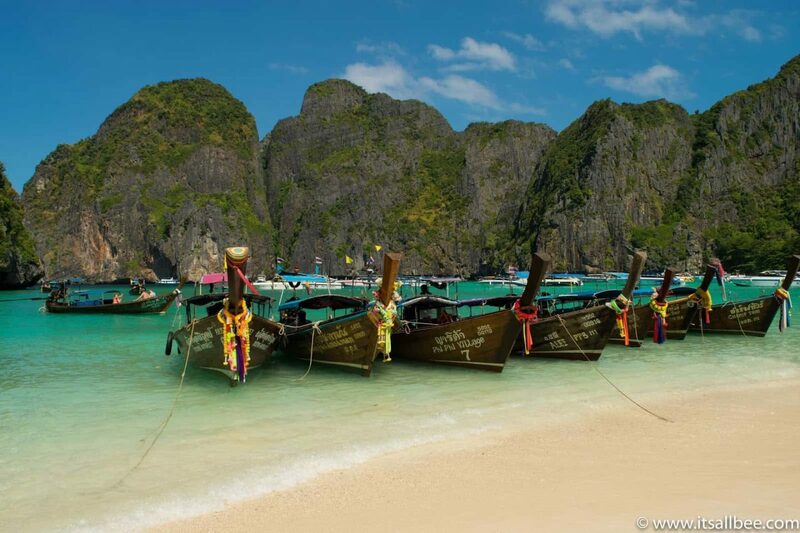 From Phi-Phi island, there is boats and ferry services to the other equally destination that is Krabi Island. For tips on where to stay in Phuket, I have a post on the best areas to stay in Phuket which includes tips on hotels for budget, mid-range and luxury budgets. As the penultimate leg of your Thai trip comes to a close, how about ending it on a memorable beach destination? Krabi Islands is one of those parts around the world where you can still expect some serenity on the beach. The presence of more than one awesome beach is perhaps the reason for you to get that very necessary relaxation you have craved all your life. 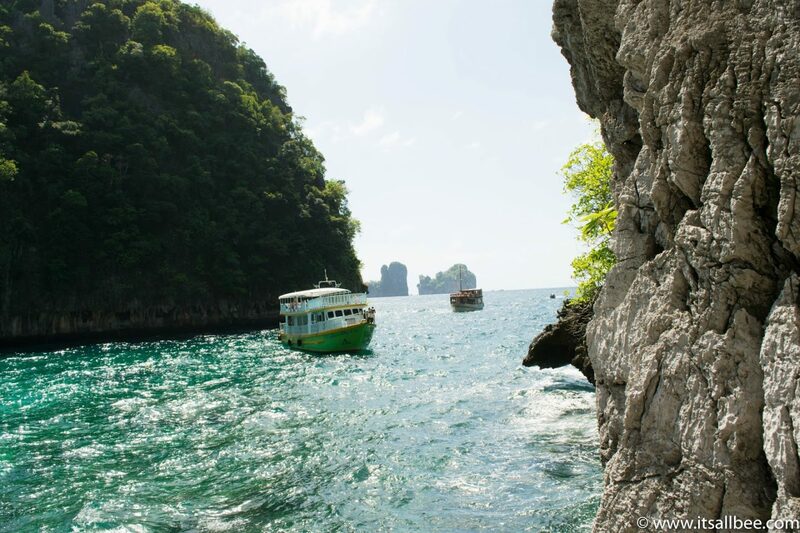 Once you reach Krabi Islands, the first step is to book a boat that shall take you to Railay Beach. Though a little away from the city, it is definitely better at that way. The Railay Beach has lush green landscape, amazing hilltops, and uneven landscape and the beach waters in its cerulean tones to mesmerize you. You can spend an entire day here and then go back to your resort in Krabi. Likewise, you can spend the rest of the evening exploring the Krabi Town. Usually, the tourists spend an entire day exploring Railay Beach, and it is not surprising. 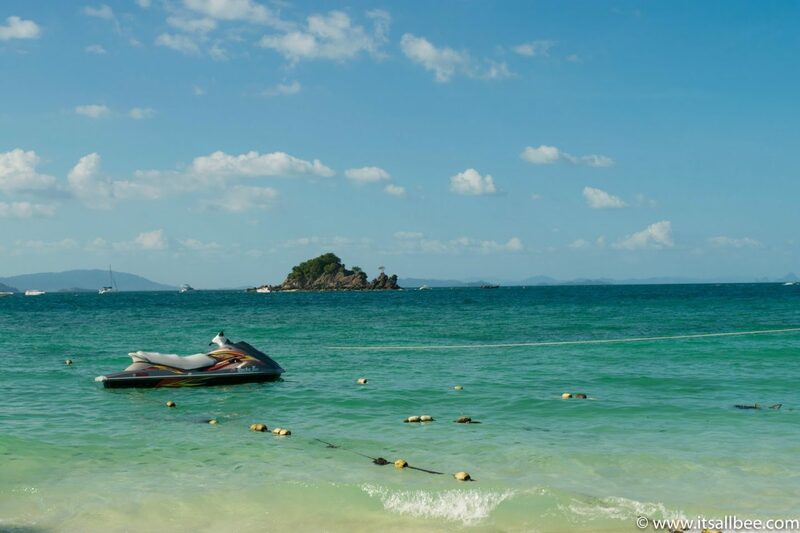 The next day you can go to the Pak Bia Islands if you love white sandy beaches and more beach activities. The island is ideal for those willing to detox and relax or simply cannot have enough of the waters. You can even take a boat and go back to Krabi Island. If you have time in hand, you can even try going to the Thung Teao Forest Natural Park and take snaps of the beautiful Emerald Pool. Your next day can begin with a trip to the dense forest of Khao Phra Bang Khram Natural Reserve adjacent to which there is the Klong Thom Hot Springs. Tourists can just take a dip in these naturally therapeutic waters that have come out of volcanic rocks. Just 46 km from Krabi is a quaint little island called the Mu Koh Hong where you can camp and indulge in water sports like snorkeling and even dining on some of the sumptuous seafood. After spending four days in Krabi and taking in all the sights and sounds, you can surely make your way to yet another scintillating destination on your trip. That destination is the Koh Samui, and you have an option of taking a bus and ferry to go to this island from Krabi Islands. Likewise, a faster alternative is to go by air, which might take less than an hour but with a higher price tag. The first day you can go to Chaweng from where you can take a thirty-minute cab to Koh Samui’s Big Buddha temple. The temple is on a high altitude allowing you to get a bird’s eye view of the nearby places. You can then check out the Secret Buddha Garden where there are plenty of Buddha statues made of stone. Great spot to be in for a photographer! Next stop can be the Wat Plai Laem temple that has an imposing statue of Guanyin, a goddess with eighteen arms. The massive size of this idol is something to take in with time and of course, the overall beauty of the temple’s environs will be awe-inspiring. A visit to Koh Samui is incomplete without the day ending with shopping at the Chaweng Night Market from where you can shop for anything under the sky literally. Next day, take a ferry to the party islands of Koh Tao where you can spend the daytime diving or swim through the crystal-clear waters around the island. Post sunset, the party begins and goes on till mornings and that is what makes the Koh Tao even more important. Another day trip can be to the Koh Phangan. You can go back to Koh Samui by ferry in as little as thirty minutes. Not just islands and beaches, Koh Samui also has Na Muang Waterfalls and Ang Thong Marine Park for those who love nature at its pristine best. As the trip concludes, you will surely have this feeling of wanting to visit the soulfully captivating country of Thailand again. This is what makes Thailand all the more special and great in every way. I have left enough room in the itinerary if you wanted to switch it up and add Khao Sok National Park, Koh Lanta, Koh Phangan or Surat Thani which is easily accessible from Koh Samui. As far as where to stay in Thailand during your 3 weeks Thailand itinerary really depends on your budget and preferred comfort levels. 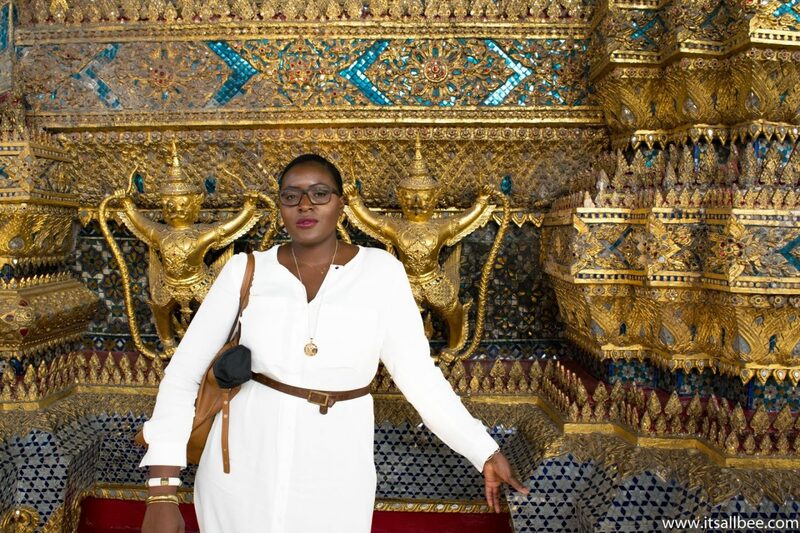 I shared where we stayed in Bangkok in addition to providing a guide on the best areas to stay in Bangkok. I did the same for Phuket where I shared a guide on areas to stay in Phuket but also shared tips on the best hotels in Phuket for all budgets. We sampled a couple of places in Phuket at low, mid and luxury budgets which have all ben documented on the blog. By far my favourite website to book my hotels is Booking.Com as well as Hotels.Com which had some great January travel discounts. One of the reasons I love Booking.com is that you can book hotels in advance and still be able to cancel them if your plans change. So you can book your hotels for Bangkok, Chiang Mai, Phuket, Krabi and Koh Samui in advance but should you should to add say Chiang Rai or another Thai city you can change your booking easily on their site but for travellers they also have a great mobile app that I find really handy to use on the move. Thailand is a pretty tropical country so even in the rain season, you will find that it clears quickly and before you know it, the weather is good enough to lounge on the beach. For tips on what to pack for Thailand, check out Wandering Quinn. So we are now on to how much money to take to Thailand for 3 weeks. As I mentioned above when it comes to hotels it really depends on your preference on comfort. You will be glad to know that there are plenty of amazing places to stay from hostels to luxury hotels and villas that won’t break the bank. 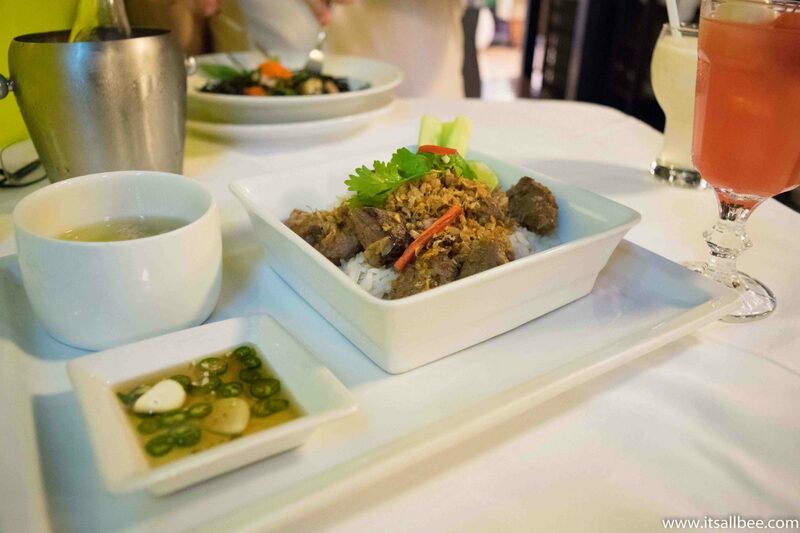 Food is also super cheap too as you have your pick from tasty street food to lux Michelin star restaurants. Your flight will mainly be the most costly of expenses for the trip to Thailand. Hotels can be as cheap as £20 a night. For budget hotels in Phuket check out my review of Gold Diggers Resort and for mid range check out my post on Ikon hotel and for something more in the Luxury hotel market we also stayed at Renaissance Hotel in Phuket. 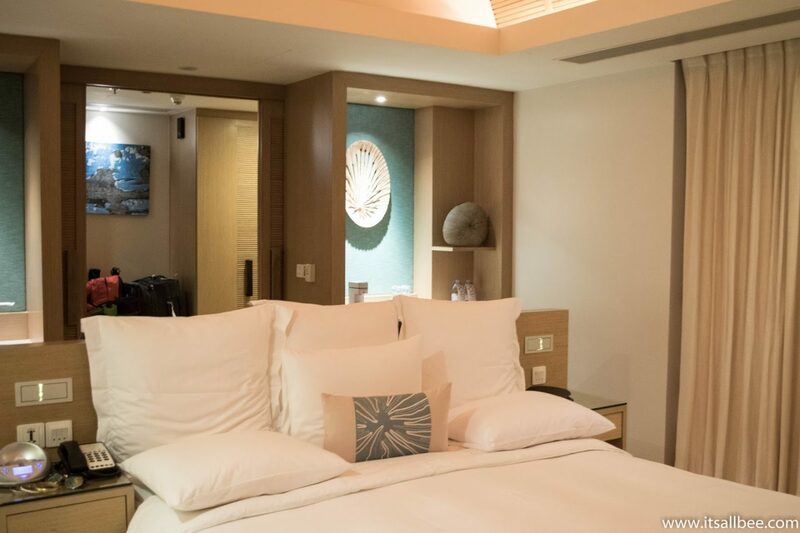 To estimate your hotel expenses I would recommend using the above Thailand itinerary and then costing the hotel nights in each city for the type of hotel you prefer. Once you do that I would then suggest you cost at least one whole day tour in each city. 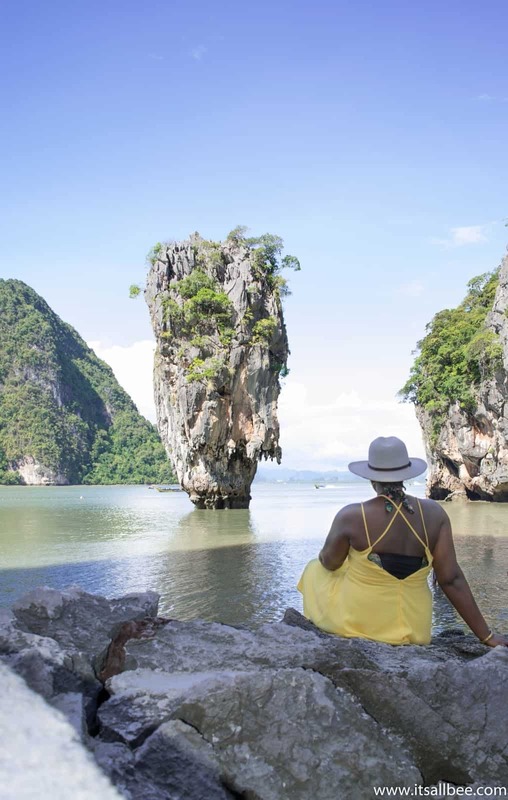 So for Phuket, we enjoyed 2 island hopping day trips which saw us exploring Phang Nga Bay as well as James Bond Island the various activities included in that. Most of these tours will range from £30 and up depending on activities included. Again I have included a couple of tours for inspiration but also check out Viator Tours for more. You can easily budget for £100o for your trip after your flight. If you stay in reasonably priced accommodation, factor in tours, transport and food and you could do that on a budget. For a more mid range budget to lux you are looking at £2-3k+. So, if you are one of those thinking “is 3 weeks in Thailand enough“, hope the above gives you an idea of just how much exploring you can do in as well as an inkling to how much money to take to Thailand for 3 weeks. The other element I wanted to include is that of getting around between the islands and the cities. We flew from Bangkok to Phuket and then used ferries between islands. Flights you can easily book with Expedia or directly with Air Asia. Our sites between cities were not more than £50 return so if you are buying one way expect even less but also look out for additional luggage charges so pack wisely. There you have it, a perfect 3 week Thailand itinerary. Is there any other place you would have included? 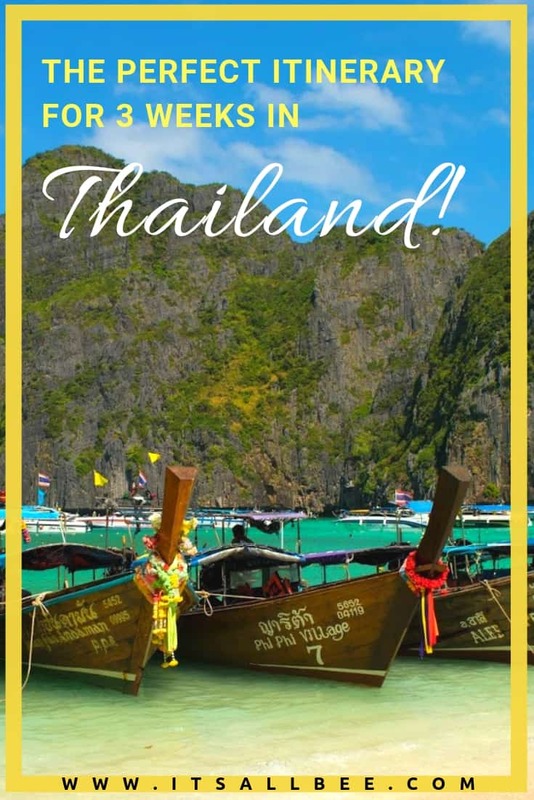 This is an amazing list of activities for the 3 week itinerary for Thailand. I have been searching for ideas I am considering a Thailand itinerary 3 weeks November 2019 OR a Thailand 3 week itinerary in December. This is an amazing post. I thought I had to start early to plan for may trip to Thailand but your post has been so amazingly helpful. Thank you so much. That’s awesome Bess, I am so glad that you found this helpful. 3 week Thailand trip is just such a treat isn’t it? All the best with your travels and let me know if you have any questions on the Thailand three week itinerary or any questions on Thailand costs of the trip or how to travel around Thailand. I absolutely love your blog. 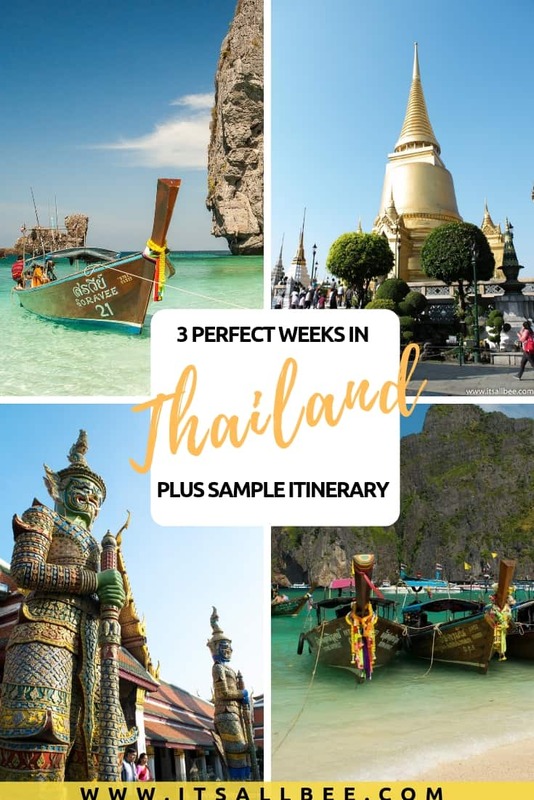 I was after a Thailand itinerary for 3 weeks in July and this certainly looks perfect to supplement my trip planning for a 3 week itinerary for Thailand Cambodia Vietnam. I am not sure if I have that enough time to do all three countries but your itinerary for Thailand is giving me something to think about. I suppose you could you do one week in Thailand a week in Vietnam and a week in Cambodia. I have covered both Thailand and Cambodia extensively so that should definitely give you some idea for activities to do in all the countries. I haven’t (yet) been to Thailand but boy, do I want to get there! It looks so exciting from the pictures and videos I’ve seen. Bangkok and Phuket look especially dreamy I need to start planning a trip to Thailand. I would love to be able to do backpacking Thailand for 3 weeks but I don’t have as much time; a week is much more achievable. The beauty of Thailand is that its amazingly cheap so if you can only do a week at a time. You can certainly break on the Thailand itinerary and return time and time again. What an informative Thailand itinerary. 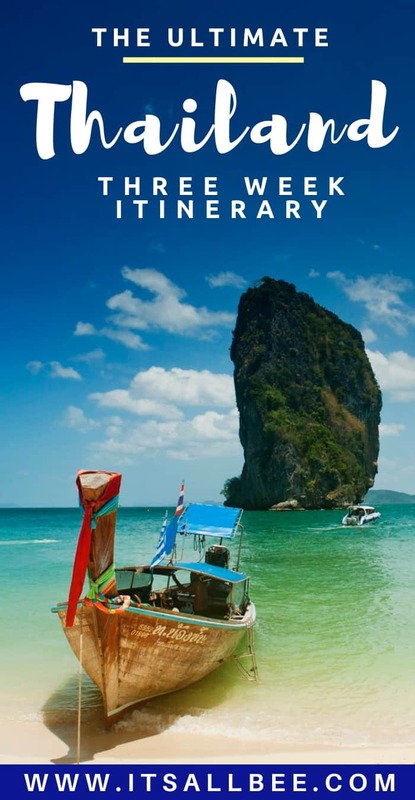 I have been searching for a Thailand itinerary 10 days of travel but this definitely looks like something I could use to put my trip together. Granted I am not doing Thailand in 3 weeks but it has given me so many ideas on places to add to my list of places to visit in Thailand. After Thailand, I am doing Cambodia and Vietnam. You would have a Thailand Cambodia Vietnam itinerary would you? Any additional help on things to see and do in Thailand, Cambodia and Vietnam would be of help. Hi Tony. I am glad you found that useful even though this was geared towards a 3 week holiday in Thailand itinerary. I have a couple of posts on Cambodia on the blog. Hopefully that will be useful as well. Great, I really like your Thailand itinerary. Very comprehensive and lots of options to detour to other cities in Thailand. I love it.! I am in the mist of plannin a Thailand itinerary 3 weeks in July this year. This really gives me so much to thing about about. Most of the places I want to see are included so I just need to focus my research now on transportation in Thailand and how to travel between the cities you have mentioned. I am heading to South East Asia and looking to do a 3 week Thailand backpacking itinerary and this just simply looks amazing. I love that you also have plenty of links to things to pack for 3 weeks in Thailand. Really in love with your blog. Thank you so much! Aww, thank you for your comment, Suzanne. I am sure you will have a ball in Thailand. I love this itinerary and I am now wondering whether to ditch my 3 week itinerary to Thailand Cambodia Vietnam in favour of your 3 weeks in Thailand ititnerary. I love that you have included samples of all the best parts of Thailand and cool points of interest to visiting in each of the cities. I am thinking of combining a 3 weeks in Thailand itinerary with a trips to Cambodia and Vietnam. This is such a great round up of all the places to visit in Thailand. I have been meaning to visit Bangkok, Chiang Mai and Phuket for such a long time. I love that you have included all the places I want to visit in one itinerary. Thank you for this. Thank you for your comment Britney I am sure you will enjoy Thailand, Cambodia and Vietnam. I am heading to Thailand and have been looking and Thailand itinerary 1 month but this will definitely do! Thank you so much!